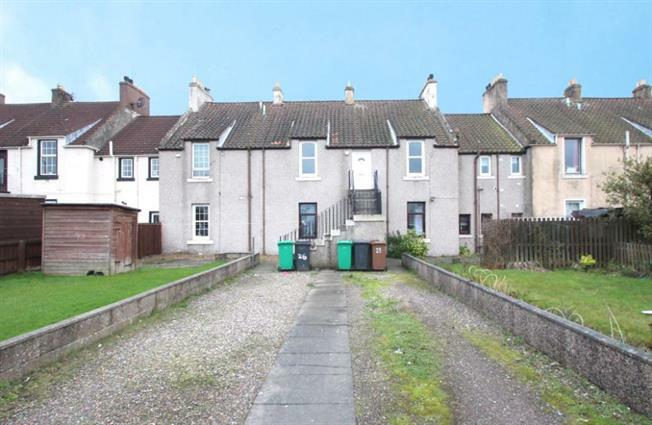 2 Bedroom Upper Floor Flat For Sale in Leven for Offers Over £50,000. This upper floor apartment is conveniently located for local amenities within Methil. Freshly presented in good order throughout, the property offers generous sized accommodation and should appeal to a variety of purchasers including as a first time buy, buy-to let or as a smaller family home. The property is entered via an external staircase into an entrance vestibule and hall providing access to the internal accommodation comprising of; bright lounge with feature alcove/storage; dining kitchen with fitted base and wall units, integrated gas hob and electric oven with space for dining furniture and for other free standing appliances; 2 double bedrooms with built-in storage/wardrobes and a family bathroom. The substantial garden is laid mainly to lawn with chipped area providing ample off-street parking.